Anyone who has been at all close to me since I was a sixth grader, knows about my fascination with vampires. I know way too much about vampires both in myths and legends and in the fictional works where these undead creatures are the stars of the show (yes even Twilight, a lot of teen and pre-teen girls had that phase). 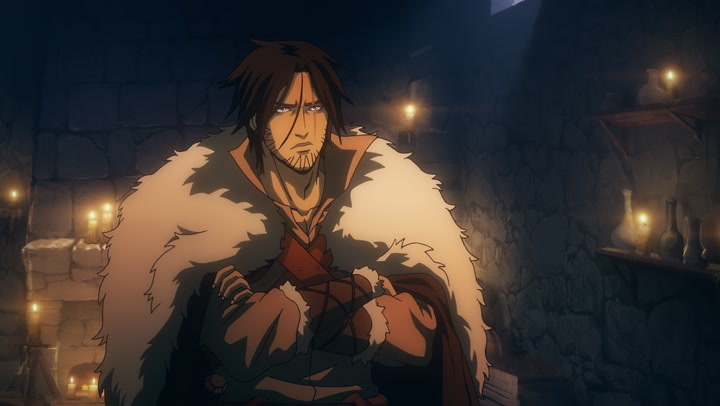 So I was excited when I saw an anime for the Castlevania series on Netflix in 2017. I watched the entire first season in one sitting (though that wasn’t exactly hard, the season was only four episodes long at thirty minutes each) and I was desperate for more of the story. 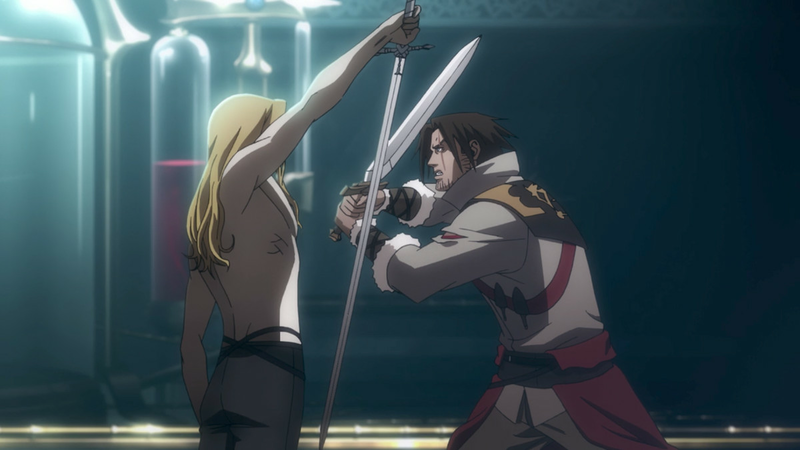 We get a lot of new characters, some without names, but the main new characters are antagonists to our heroes: Trevor Belmont, Sypha Belnades, and Adrien Tepes aka Alucard, and the show focuses more on them than on our heroes and developing their dynamics. There’s Hector and Isaac who are forge-masters to Dracula and they essentially create new nightmarish vampire ghoulies called the Night Horde from the victims of that Night Horde. Hector is a bit naive and childish (something that even Isaac and Dracula state at one point) and dislikes humanity, but doesn’t necessarily want everyone suffering, and is more fond of animals and his resurrected pets than anything else. Then, there’s Isaac who is 100% loyal to Dracula and the plan to completely destroy humanity and may or may not be gay. Carmilla is pretty much just there to betray Dracula, stir up trouble, and call everyone children while not seeing the similarity of her manipulating Hector away from Dracula to a child sneaking a toy away from their sibling while their back was turned. Then there’s Godbrand, a Viking vampire who is really only there to be the first one to turn traitor with Carmilla and get killed by Isaac. Another thing… the show says Isaac is totally loyal to Dracula and implies that he may be a little gay for him. They left Isaac’s sexual identity a bit of a mystery, but in his flashback we see him being whipped by a white (possibly priest?) guy and the man is obviously angry with him saying that he’s a thief that would be dead in the gutter if he hadn’t taken him in, with Isaac eventually saying he wanted to learn to help the man with his work because he loves him, and it ends with Isaac stabbing his thumbs through the man’s eyes into his brain in order to kill him. A backstory that we didn’t necessarily need to have, just like we didn’t necessarily need to know a bunch about Hector aside from they’re on Dracula’s side planning to wipe out humanity and thus are the bad guys. There’s a lot going on with the villains and I’m certainly someone who loves a good villain, but the audience spends so much time with them that we get a lot less time with our actual heroes. 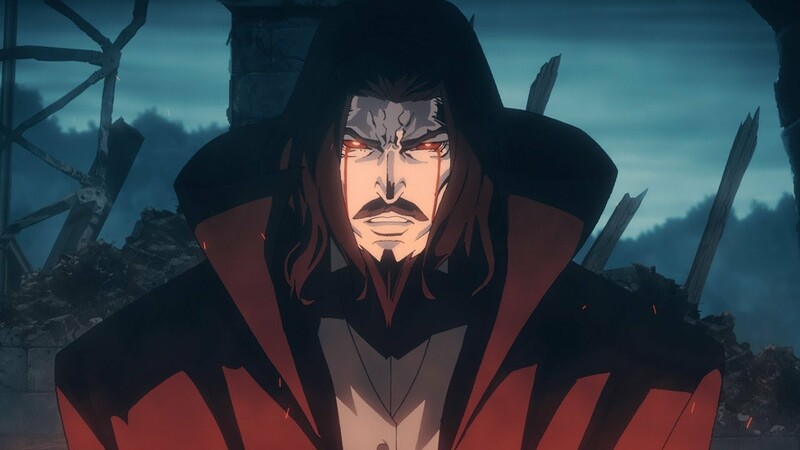 Seriously, for every minute we spend with Trevor, Sypha, and Alucard we have to spend another five watching Carmilla manipulate Hector or Dracula talking to Isaac about his hatred for humanity. One of my coworkers, Nate, described it best when he said, “It’s like they realized that they couldn’t just do a bunch of exposition for season 3 and they actually had to kill Dracula this season.” and he’s really not wrong. The action scenes, when we do get them, are phenomenal, but it’s a lot more of a political scheming situation then an all-out war for the fate of humanity. The fight scenes from the first season are absolutely incredible whether it was Trevor against some villainous priests or he was fighting a cyclops, or when he and Alucard actually went toe to toe in the season finale, and we definitely got plenty of opportunities to watch Trevor fight. This season didn’t have nearly the same amount of action. 4. Was This In The Games? Was the story telling great? Yeah, I think so. Could it have been done better? Absolutely. Rather than focusing so heavily on the villains and their motives I would have loved to see more interactions between our heroes. In the end, Trevor and Sypha go off together and it seems fairly romantic in nature (even though Trevor says she’s the closest thing he’s had to a friend in years), but that kinda came out of left field for me. I didn’t play the games that the anime was based on growing up, so I didn’t know until I looked them up after the first season that Sypha and Trevor were love interests at one point. Even getting married and having kids. So for someone else who grew up playing the games and knowing that the pair would eventually have a family together maybe they didn’t need more interactions between the two, but for me, that kinda came out of nowhere. 5. So… Are You Friends or Not? A lot of the interactions between the heroes kinda threw me off. Between Alucard looking down on Trevor and his family for being vampire hunters (and killers) and knowing that the vampires the Belmonts killed were probably murdering a lot of people; Alucard just seems overall dissatisfied with the whole thing. Almost all of his dialogue could basically have been replaced with “I’m doing this because my mom wants me to; I take no joy in any of this.” When he’s not looking down on Trevor, they actually seem to get along rather well; however, every time it’s Trevor and Alucard talking without Sypha there, it just feels awkward. There’s some interaction between him and Sypha that implies friendship, but there’s not a lot of development there. At one point, he even warns Sypha that befriending Trevor might not end well for her, which I personally saw as an older brotherly thing to do, but I don’t know for sure. There is a satisfactory ending where Dracula dies and the world is probably safe–for now. Trevor and Sypha go off to see her speakers and then have adventures. Alucard is given the castle and the Belmont estate to do “something good with it.” Carmilla has essentially taken Hector as a slave. Isaac is in a desert and is starting his own ghoulish army of people he’s murdered and turned into monsters. It wraps up the goal for the season of kill Dracula / save humans, but allows room for a third season if it’s desired. I’ll be honest, I really did like this season. I thought the story-telling itself was great. The animation was as beautifully done as it was in the first season. I will say that I really liked how amazing Sypha was in all of her scenes. I especially loved that there was more than just a bunch of white male European vampires helping Dracula and that there were people of color. However, Isaac is the only one given a name and the other three are unnamed vampires, two of whom are Indian and the other is unclear because her origins are not elaborated on. In the end, I wish the show had focused more on the heroes and their quest to save the world and how they developed their friendships with each other instead of on the backstories of all our new villains and the courtly intrigues of royal vampires. In the end, I still recommend the series to anyone who loves a good vampire story or who grew up playing the games. It’s not a perfect anime adaption, but it sure is beautifully animated and worth the watch.